You can decide and Fix any parking charges for the parking of vehicles in the Markets, Commercial places, multilevel parking, to decongest the roads and to control the pollution. 1. Please note, for every sale of all such vehicles Govt has already earned a huge share in VAT, EXCISE, Registration charges, Road Tax as well the service tax on the insurance policies of these vehicles, and the Income-tax from the genuine buyers. They are already earning a lot on the sale of Petrol and Diesel for all these vehicles. Even after the GST regime, they still have a huge share out of the 28% levied on vehicles. 2. 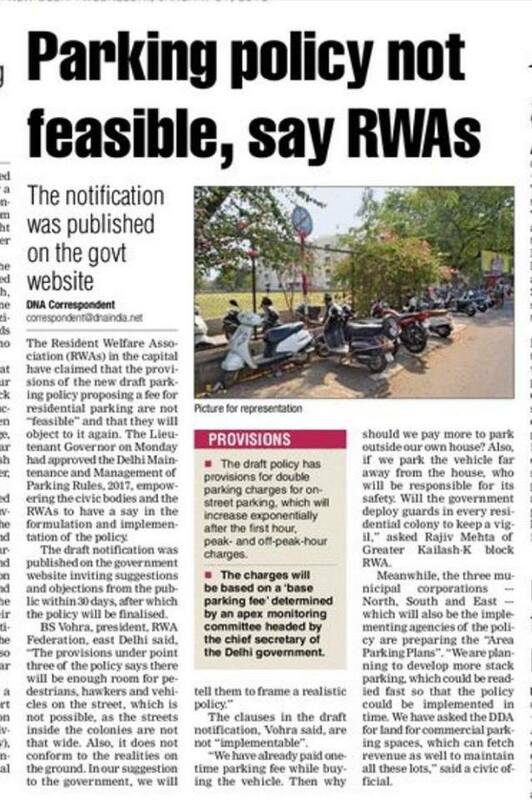 It’s sad and shocking that now Govt is eying the parked vehicles of the residents, outside their own home. 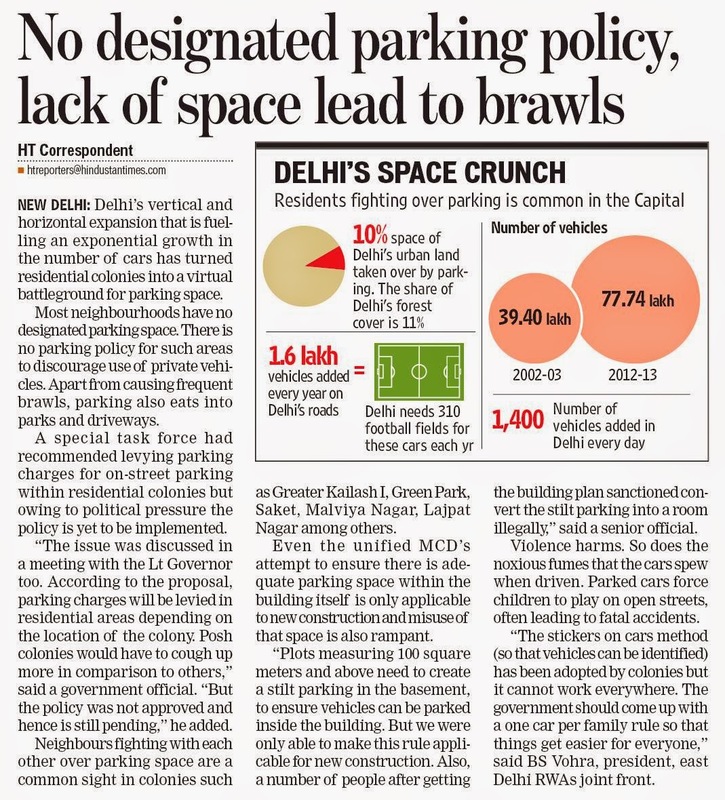 They are absolutely wrong in saying that residents are using Free of charge space for parking their own vehicles, outside their own homes. 3. When the colonies were developed years ago, prices of plots were decided on the basis of the size of inner roads in that area. The posh localities had wide inner lanes and therefore the cost of plots was on the higher side. The middle / upper middle colonies had a bit smaller roads and therefore cost of plots was lesser than the posh localities. Whereas the lower colonies had narrow lanes, and hence the cost of plots was also on the lower side. 4. Now after 40 – 50 years, if Govt says that these colonies are using the public land Free of cost, THEY ARE ABSOLUTELY WRONG, as we have already paid the price of such inner lanes via the purchase price of our residential plots. Do you think that developers of these colonies were that much fool to offer inner lanes free of cost, causing huge losses? 5. Moreover, there is no traffic in the inner lanes, except in the commercial areas, and no one is degrading the pedestrian environment in any way. Instead, it’s the policies of the Governments that degrade everything to levy a charge later on. 6. Sometime Emergency vehicles face some problem while entering the inner lane, and it must be given a serious thought that how Govt can purchase such emergency vehicles that can easily enter the narrow inner lanes. But how do they think that by charging the parking charges, the way for the emergency vehicles will be opened automatically? 7. Instead of restricting the sale of new vehicles in Delhi, Govt is now eying to earn more by way of HUGE PARKING Charges on all the vehicles parked by residents, outside their home. 8. The problem has erupted as Govt has not formed any vehicular policy for the sale and purchase of Vehicles. Everyone is free to buy any number of vehicles as Govt is GETTING HUGE SUMS BY WAY OF VAT, EXCISE, ROAD TAX, SERVICE TAX and, GST NOW of 28% and that too after paying Income Tax. Why don’t they attach the vehicles with the Pan Card to check and control the sales of vehicles? 9. A typical vehicle stays parked 95 percent of the time. A 2006 study by the Central Road Research Institute in New Delhi estimates that of the 8,760 hours in a year, an average car’s steering time is only 400 hours. This means it is driven for only about an hour a day. In Delhi, this may be 3 to 4 hours a day. It clearly means that while parked at home, these vehicles for 95% of the time are not contributing to any Congestion or pollution. Therefore, Govt must concentrate on the 5% time of these vehicles while they are either congesting the roads or polluting the environment and hence must levy hefty charges and penalties so that residents are forced to leave them in the parking itself. It will automatically discourage the sale of new vehicles, though Govt may be against this policy as it will impact its own kitty. 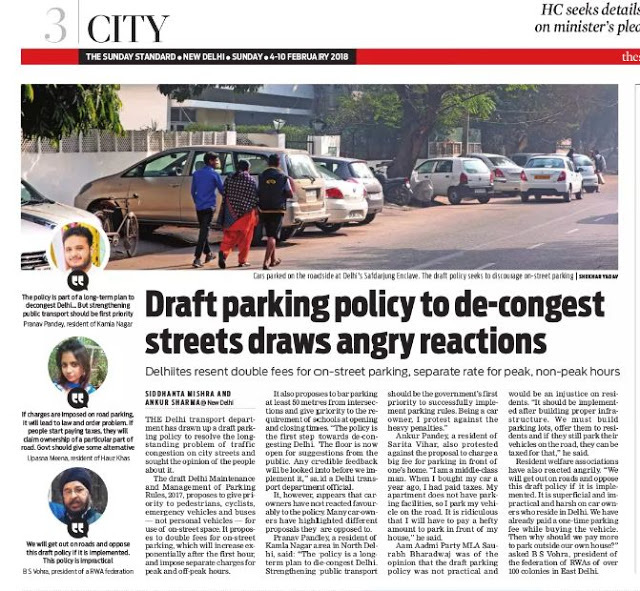 Therefore we are absolutely against the imposition of any parking charges from the residents, for the parked vehicles outside their home as it will lead to unnecessary harassment and chaos. Delhi Government has already rejected the clauses of the Draft Parking Policy that related to the term Parking charges for Parking of your own car in front of your own home. We at the RWA Bhagidari had very strongly objected against the above-said clauses. Now it is being heard that some of the RWAs have moved to the National Green Tribunal supporting the issue. We hereby ask from you that Would you like to pay any sum, say Rs. 5,000 a month, for parking your own car in front of your own home? Just can't understand how our learned RWA friends are so eager to declare the Common area of any locality as the Public land. Just think of the consequences. Govt can sell public land. Govr can allow the public land to anyone for any purpose it thinks fit. Would you allow the small space outside your home to be declared as a parking space as public land, while your vehicles are parked inside and others in front of your home? Won't it be a big nuisance for the safety n security of your family? The authorities just want maximum from the residents while doing the minimum. 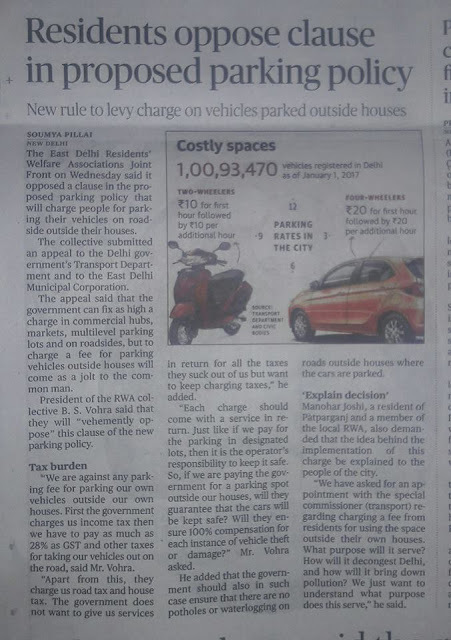 It has become the most polluted n most congested city, not because we are parking our car out of our home but because they have collected all kinds of taxes on the sale of over 1 crore vehicles in the city, while they don't have parking facility for even 72000 vehicles ECS. It has become the most polluted n most congested city because the Authorities have allowed Encroachment at almost every stretch. It has become the most polluted n most congested city because the money collected by various agencies never reached the public.